CKM MILITARY IS THE MOST ADVANCED COMBAT SYSTEM IN THE WORLD!! The Commando Krav Maga Military program is a custom tailored program designed specifically for each individual military unit. Diversity of need based on level of combat exposure and other considerations make it imperative that tactics and techniques be targeted at what each soldier may encounter in the field. Considered by many experts to be the most evolved and effective hand-to-hand combat system, the Commando Krav Maga Military program is also the most advanced tactical hand-to-hand fighting system in world. 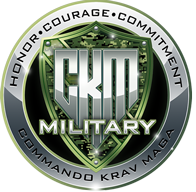 Founded by Moni Aizik, a former Elite Commando of the Israeli Special Forces, our CKM Military program is the ultimate reality-based system for soldiers engineered for the most brutal and vicious close quarters battle confrontations imaginable. With its no-nonsense approach and straightforward practical moves, CKM Military prepares you for the unexpected with techniques and tactics that can be executed effectively under the extreme pressure of real-world conflict. Chief Instructor, Moni Aizik, works with many military units around the world including the Israeli Army, U.S. Air Force, Canadian Special Forces, Jamaican Special Forces, and more. His ability to custom tailor effective training programs to meet the special needs of the soldiers he works with is exemplary. One key concept of the CKM Military program is “Simplicity is Genius!” Any technique that requires more than two gross motor skills is extremely difficult to perform under stress. CKM Military is designed to be simple and universal so you do not have to think about your next move under stress but simply react instead. 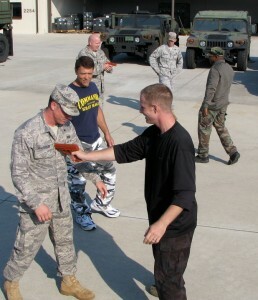 Although the tactics and techniques are simple to perform, it took years of research and field-testing to refine and evolve the CKM Military program to where it is today. The goal of the CKM Military training program is to be field ready in the shortest amount of time possible while providing solid solutions to real-world military scenarios. All the tactics and techniques in the program have been tested to be effective for a wide range of body types and strengths to ensure that our heroes have a better chance to return home safe when there work is done. Mind over body special training-How to make your special unit guys tough and being able to finished any mission successfully no matter what! 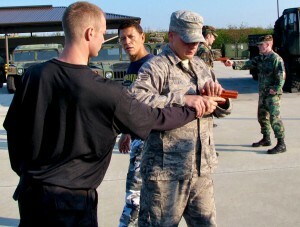 CKM Military Training Camps are custom developed around the unique requirements of your unit. Contact us today to schedule a training camp for your unit.